The Make My Trip Package we had chosen is called 'East Delight with Lachung.' 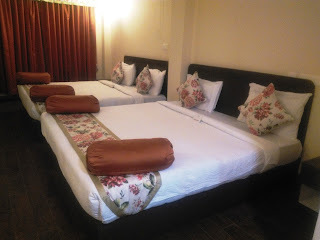 Cost per person for this 6 nights trip was Rs 37,000. 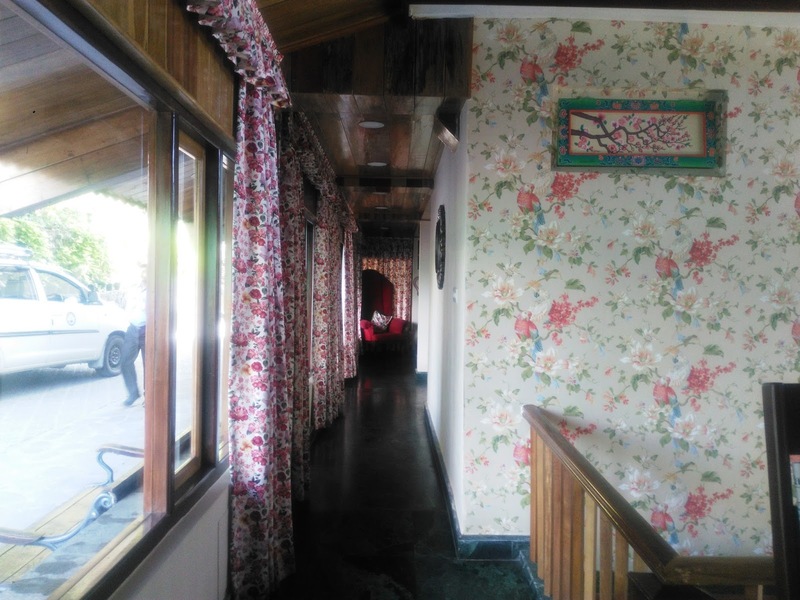 It included the flight tickets from Bangalore to Bagdogra, airport transfers from Bagdogra to Gangtok and 1 night stay in Lachung, 1 night in Darjeeling and 3 nights in Gangtok with breakfast and dinner on all days. In Gangtok, the hotel was Summit Namnang Courtyard and Spa. Summit is a group of hotels quite famous in this part of the world. 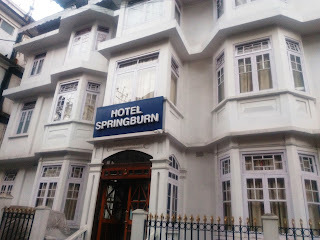 In Sikkim itself, they had 3-4 hotels and in Darjeeling too. The rooms were beautiful, with a great view of the mountains. But what didn't work was the breakfast and dinner spread. The service of the staff at the restaurant was poor too. They were slow and quite unresponsive. We hardly ate anything. In Lachung, the stay was at Cliffview. Spacious and decent accommodation. True to its name, it had the best view. I don't remember staying in a hotel where you opened the windows to this majestic view of the mountains and THAT close. It was like if you stretched out your hands, you could feel the ruggedness of the rocks and run your fingers through its curvaceous paths. But of course, you couldn't stretch your hands out because it was so SO cold! The distance from Gangtok to Lachung is 125 kms and takes about 7 hours. Painful, seemingly never ending journey on bad roads. On the way, we stopped at various view points and reached the hotel in the night and went straight to bed. The itinerary was such that on all days during the week long trip, we would reach the hotel just in time for dinner and CRASH. In Darjeeling, we stayed at Springburn. The hotel had good breakfast and dinner. The staff were all Nepali. Great service. Very courteous boys. MMT promised that there would be a tour manager throughout the trip. There was none. They claimed there would be assistance at the airport at the time of arrival and departure. There was none. Out of the 7 days, two complete days were dedicated for traveling – 5 hours from Gangtok to Bagdogra airport and then, more than 4 hours in the flight from Bagdogra to Bangalore. So we spent the whole of 11th and 17th , the first and last days of the trip, in cab and plane. In addition to that, we spent one whole day traveling to Lachung from Gangtok and another whole day traveling back from Lachung to Gangtok. When the itinerary is sent, you don’t realize the extensive travel it involves. We used to reach the hotels just to spend the night sleeping. Next day early morning hit the road again! MakeMyTrip service was atrocious. Not just us but many others, we met during our stay in the hotels and on our flight, had had bad experiences with them. For starters, many of them had been given wrong flight information. There were no such flights in that hour to that location. So any info regarding flights you get from MMT, always double-check. We realized from experience, our own and other fellow travelers', that MMT is extremely negligent with respect to information as critical as flight details. And when you talk to them about it, they blame the airlines (Indigo, in our case). And Indigo, of course, wipe their hands off it saying it's the responsibility of the tour operator. When we spoke to the customer service, their response both on mail and over phone was clearly of “what do we care?” types. They had done the group bookings for hotels, flights and sight-seeing taxis and they were not obliged beyond that. They got their cut from every transaction. The customer saved a few thousand rupees thanks to shared cabs. All this meant, MMT was not ready to listen or take responsibility for anything else. Since we had booked online and the person who interacted with us was from another city (Delhi) there was no way we could directly approach him. Our driver was narrating incidents of how people would come through MMT and get into verbal and sometimes even physical fights with the local cab driver/hotel. Some threatened of beating up the MMT guys, some of complaining to the police. The reason was always all the false promises made by MMT. The drivers themselves were paid a pittance and had to endure delayed payments repeatedly. One young couple we met suggested to always go to local offices for any bookings with these package travel dealers. You tend to have a better experience when it is done across the table rather than online. It is easier to get an answer from them as one specific person handles your account and he is directly responsible for you. In the case of online bookings, the mails are read and replied and calls attended to and passed on from person to person without any sense of accountability. The email ids and phone numbers they provide for assistance is of no use. Once the payment is in their account, they are least bothered what happens to you. You will have to chase and do all the follow-ups whether it's for the flight tickets or contact person details. Lesson learnt from this trip? No more Make My Trip for me - ever. Even if their current brand ambassador is Ranveer Singh, who I am a big fan of. Oh Sweety.....didnt know it was this bad. But its okay...many will hopefully learn from your experience. Thank you for being honest. Thanks for the warning. Is there any "authority" you can lodge a complaint about them? Someone similar to Better Business Bureau in USA. I don't know if we have a BBB in India. I think not. My First trip with a tour operator. We always travel on our own so completely agree with all the things you said. 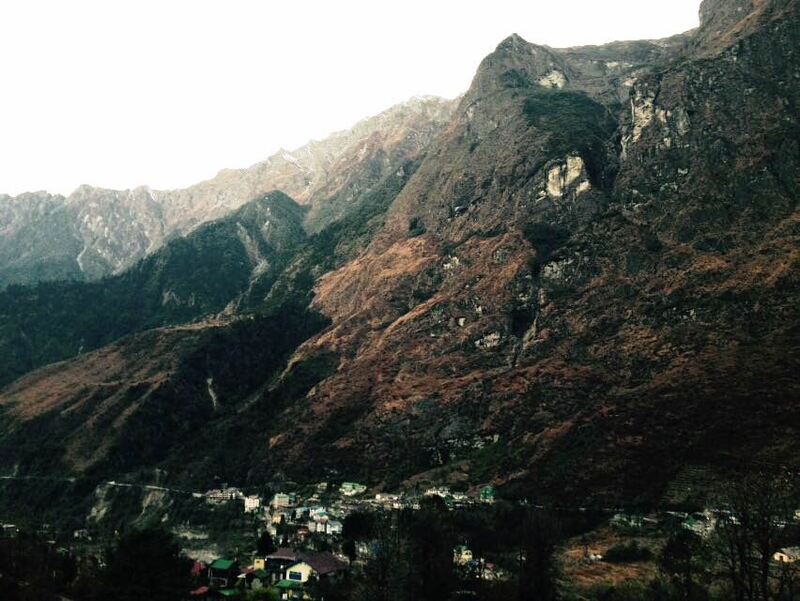 Sikkim is such a beautiful place, and I feel bad you had to go through so many hassles. We did our Sikkim trip quite a few years ago. We didn't go through any agency, we just booked the hotels, flights everything through the net , and we never had any problems at all. All the taxi drivers were very friendly and informative, and food served in some of the small hotels where we stayed was very good , specially made after asking us for our choice. We did Pelling, Yumtangh Gangtok, etc., but only Sikkim. We were not with any tour group also. 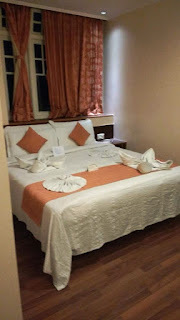 I had even blogged about Sikkim. Anyway, one always learns with such experiences, for we too have had some bad travel experiences. Ah! Pelling! Now they have an option ...To choose either Pelling or lachung in the package. The trip was good and we enjoyed for sure. Just that MMT needs to work on its customer handling . Yup there is no such thing as a perfect travel ever. We always learn with each trip. The joy of the trip is considerably reduced if the travel arrangements are not up to the mark.I am sure you must have enjoyed despite the shortcomings of the tour operator.The view of the mountains is breathtaking. We went through a local tour operator for our Kerala themed trip. They were very good - we saved a lot of money vis-a-vis having to book everything individually. They were flexible and followed up with me for certain things which I might have forgotten! Haven't tried MMT packages, been reading negative reviews at other blogs also. Yes, the savings in terms of money is huge in tour packages. Good you had a very nice operator. There are many good ones too I am sure. MMT pioneered the whole Holiday booking business and now has turned arrogant. Oh was it that bad? We used Sipsa travels for our holidays, very reliable and pocket friendly. You've made the NE look very promising. It is on our to-go list. Sipsa travels. Hmmm. Will check them out. this is the first time i heard about them. glad you had a good experience with them. Very insightful about the state of affairs with MMT and likes! I never use such agencies for this reason, Sujatha! Had gone via Bagdogra during a trip to Binnaguri. But there was no direct flight from Bangalore then. Had to go to Delhi and take a flight from there. Make My Trip would be quite upset seeing your post. For good reasons, I guess. Your suggestion to make tour arrangements offline is a good one. Shall keep that in mind, when I attempt one. Binnaguri ! Never heard! Let me google that place. I like that you have put all the details, most of the people nevr mention the money part, which is very important to know before planning a trip. Yeah these MMT guys tie up with the locals and make money off them and us just connecting the user with the service provider. Splendid mountain view, you have absorbed all the details. Even the hotel rooms, and other buildings also mark the photography calibre in you,Sujatha. The information about the tour operators will help the readers think twice before contacting them. it was my first experience too - them.